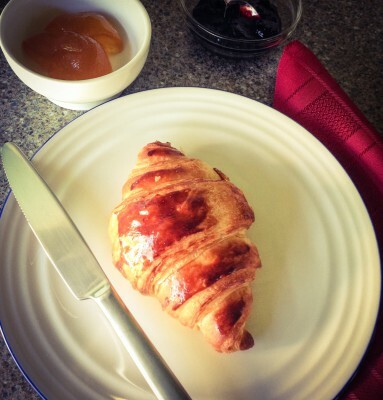 I’ll be honest, a classic recipe such as croissants was one of the reason I wanted to learn French patisserie. I remember watching a French patissier making them on television, it looked like a laborious process and initially I thought, why would you bother when you can get them from a supermarket so cheaply? Then, last year when we went to France and I tasted the pain au chocolat and the croissants on offer at Du Pain et Des Idées, I realised how good they really are in comparison to the cake-like lacking in butter thing served up at most supermarkets for you to warm through at home. The croissant is a form of Viennoiserie (translates as ‘things of Vienna’) and is another example of a patisserie product that is considered synonymous with France, despite having it’s origins in another country. This time it’s not Italy, but Austria- OK so there was a massive clue in the name ‘things of Vienna’. The croissant (meaning crescent) is thought to be a French imitation of the Viennese kipfel. August Zang was an Austrian artillery officer, who opened a Viennese Bakery (Boulangerie Viennoise) in Paris in 1838. This bakery later became very famous and the format as well as the Kipfel was imitated and the French croissant along with the Viennoiserie was born. Zang is actually quite an interesting character and despite his association with the croissant, he is better known for founding ‘Die Presse‘ on his return to Austria. The newspaper is still running today. He also owned a bank and mine in Styria, the site of the mine was renamed to Zang Valley (Zangtal) in his honour. His ornate tomb in Austria is a well visited tourist attraction in the area. The croissants in ‘the book’ did not instruct me to shape them into crescents though. Apparently they are more commonly served straight now and there have been hints that the more crescent shaped the croissant, the less butter it contains, or heaven forbid, margarine may have been used. 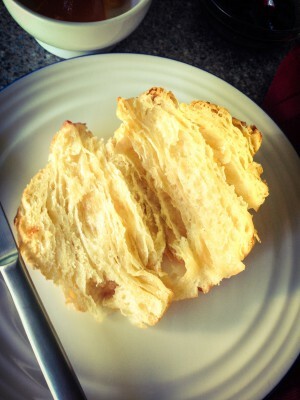 I’ve done a quick trawl of the internet and I’m not sure how much of this is truth or an urban myth…however my croissants were straight and dangerously buttery. I suppose it shouldn’t have come as a surprise to me, but I never actually realised that croissants are quite simply a leavened puff pastry. 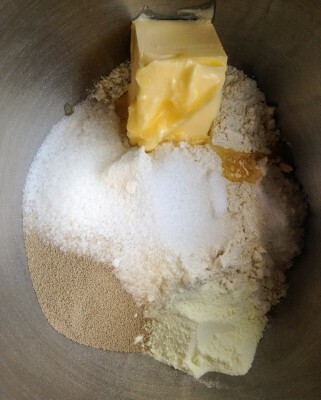 So, despite this being an advanced recipe in ‘the book’, I wasn’t too daunted by the techniques. My only concern was that the dough wouldn’t rise, I don’t have the best track record with bread and instead of using ‘fresh yeast’ as recommended, I was using a fast-action active dried yeast. 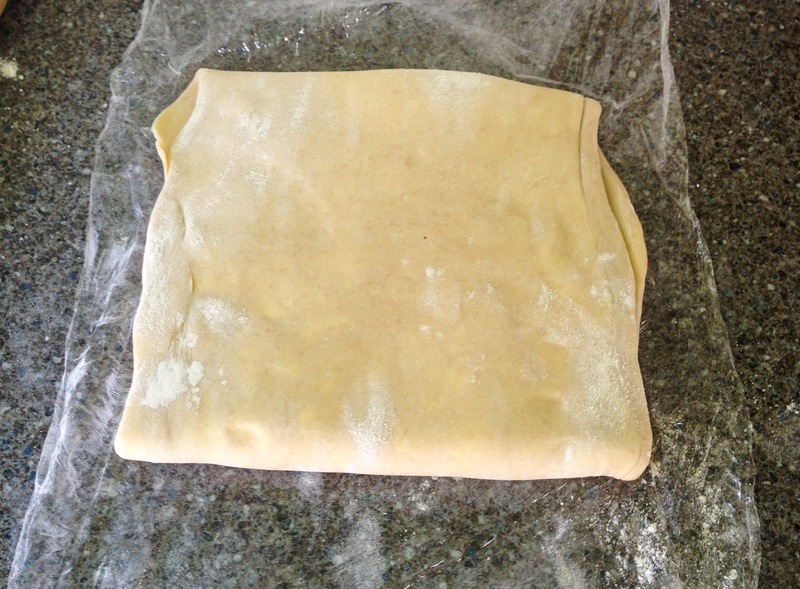 Like puff pastry, there is a lot of chilling time involved in this recipe (not for me, but for the dough). 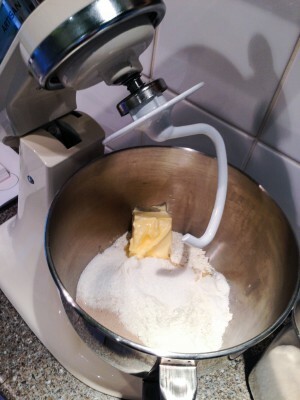 I started by assembling my ingredients and making the dough in my KitchenAid. The dough is a mix of plain flour, yeast, sugar, butter and powdered milk, this is mixed together whilst cold water is slowly added to form a dough. This is the first time I have ever bought powdered milk and I’m not tempted to start adding it to my drinks, it did give the croissants a creamy milky taste though. Some recipes seem to use fresh milk in place of powdered. I don’t know which is more traditional. Once the dough has come together it’s patted down, wrapped in cling-film and placed in the fridge for a minimum of 2 hours. 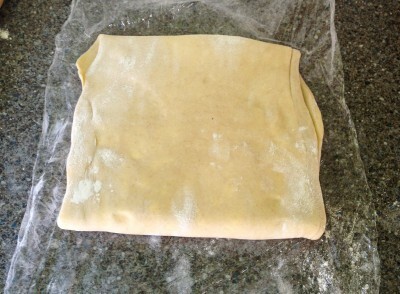 I actually made the dough quite late at night and I left it in the fridge overnight before I added the butter and began the signature folds that are so reminiscent of puff pastry. 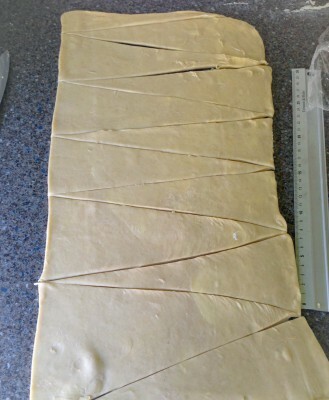 After the butter had been rolled out and added to the pastry, it was rolled and folded twice, whilst being rested for an hour after each roll. When the pastry was finally ready to use, I rolled it out to a 50cm x 50cm square and cut out my triangles. The triangles are then rolled from the base up and the tips are tucked underneath to stop them unfurling. I placed them on a baking tray and put them in the airing cupboard for two hours to prove. Once they’d risen I brushed them with egg wash and popped them in the oven for 12 minutes. Yep, that’s right, 4 hours resting time, 2 hours proving time and then they need 12 minutes in the oven. Still they were completely worth all of that time and patience. I was excited when I took them out of the airing cupboard and they’d increased in size, however when I watched them puff up and turn golden in the oven I was very pleased with myself. I don’t really agree with the ‘Advanced’ rating of this recipe, the process is quite simple to follow, but some patience is required. 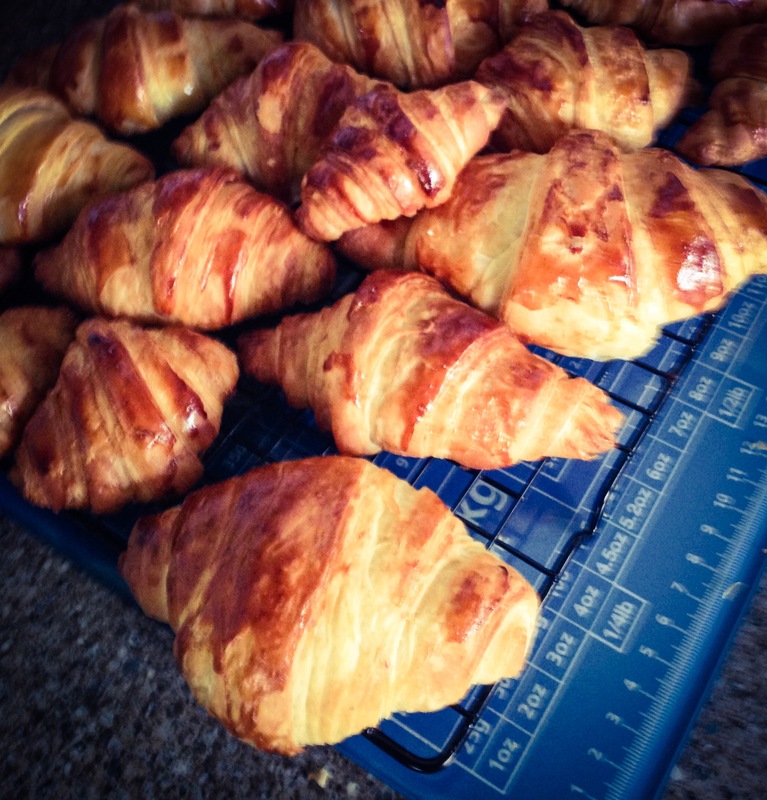 I’ve found ‘Intermediate’ level layer cakes tougher to make than these croissants. Also, the end product is quite simply delicious. 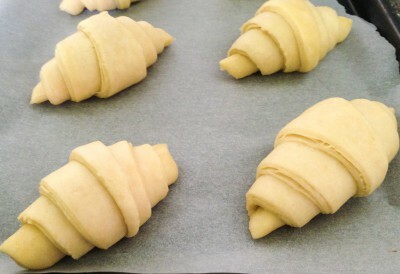 Do give these a go, the recipe is here, this same dough can be used to create pain au chocolat or pain au raisin, just add the ingredients before you roll them up to prove. Next week will be more viennoiserie, I’m getting a delivery of fresh yeast and I’ll be interested to see if there is a difference in taste and rise. oh my, my mouth is watering! they look wonderful! i’m so jealous that you’ve had the chance to have proper croissants in france. will you give any of the other recipes you’ve come across a try? i’m curious if there’s a big difference when using fresh or powdered milk. i may borrow my mother-in-law’s kitchenaid and give this a try! 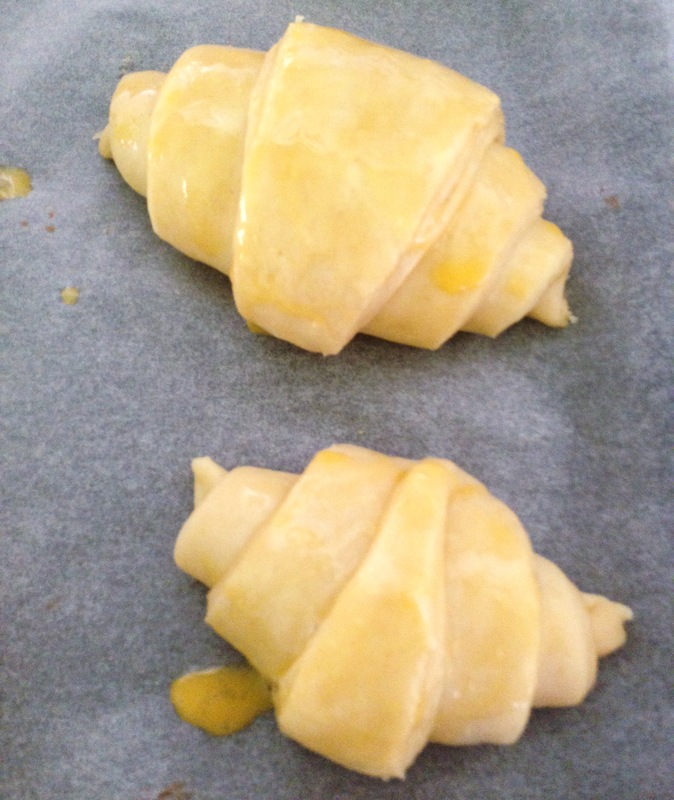 Jodie – I have made vanilla croissants as well now. It’s the exact same recipe, but with some extras added! The only reason I can think that powdered milk is added, is so that it doesn’t affect the consistency of the dough and perhaps it extends the shelf-life of the croissants – this is all guessing on my part though.